The Nobel Peace Prize Forum is pleased to announce that His Holiness the 14th Dalai Lama will be speaking at Faith and Peace Day on March 1st, 2014. 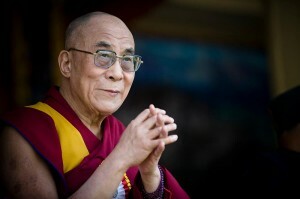 His Holiness received the Nobel Peace Prize in 1989 for advocating “peaceful solutions based upon tolerance and mutual respect in order to preserve the historical and cultural heritage of his people.” The Dalai Lama’s commitments are threefold: to promote the human values of compassion, forgiveness, tolerance, contentment, and self-discipline; to promote religious harmony and interfaith dialogue; and to preserve Tibet’s Buddhist culture of peace and non-violence. If you’ve attended the Nobel Peace Prize Forum, you know that this annual event brings together a dynamic group of speakers, including leading peacemakers in law, politics, business, economics, health, science, and the arts. The full list of speakers will be announced in the coming weeks, so keep track of us via Facebook and Twitter, and make sure your friends, family, and colleagues are on our email list so they can receive the latest program and registration updates. Save the date! Thursday November 14th is Give to the Max Day. Put this date in your calendar and help the Forum meet its fundraising goal!